Omar Khan MBBS BSc DPhil, is a Consultant Medical Oncologist specialising in chemotherapy for lung cancer, mesothelioma, ovarian cancer, renal cancer, bladder and prostate cancer. Dr Khan is a Consultant in Medical Oncology at the Great Western Hospital, Swindon. He graduated in medicine from Kings College University Hospital in 1999. After general medical training, he went on to train in Medical Oncology at the Churchill Cancer Centre, Oxford, completing his specialist training in 2013. Between 2007 and 2011 he undertook research at the Department of Oncology, University of Oxford. 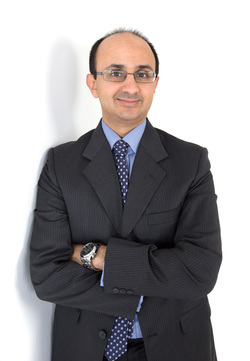 In 2013 Dr Khan took up a position as an NHS consultant in Medical Oncology specialising in the treatment of lung cancer, mesothelioma, ovarian cancer, renal cancer, bladder and prostate cancer at the Great Western Hospital Foundation Trust. Dr Khan is the oncology department lead and is also clinical governance lead. He is principle investigator for a number of phase II and phase III clinical trials in lung cancer, mesothelioma, ovarian cancer, renal cancer and prostate cancer.